Sump selection, How and why. 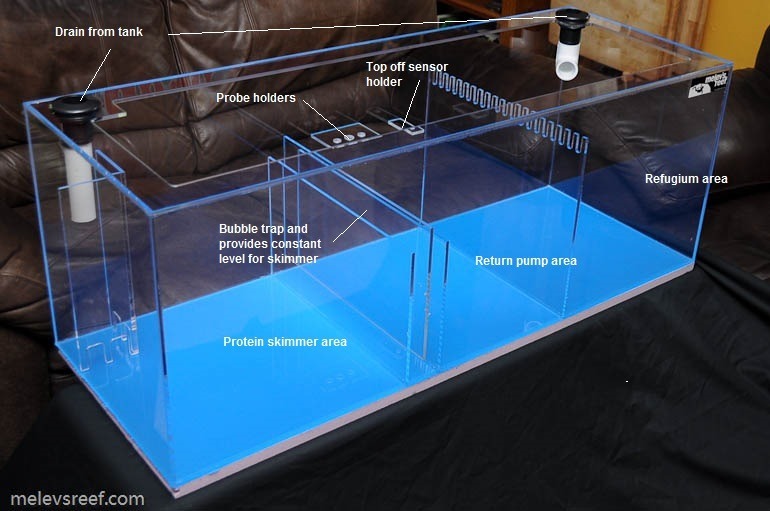 There are many sumps available in the market and all basically serve the same purpose; to create more oxygen in the water and provide an area for a protein skimmer, heater, return pump, refugium, and other accessories. It is a good idea to plan your sump out carefully so it will be a useful tool for your application. In most cases this will involve the use of a protein skimmer, return pump, probes for measuring water parameters and the use of an auto top off device. The first step is to plan on the size of your sump so you can be sure that in case of a power outage, your sump can handle the amount of water that will be drained into it. To calculate this, measure the distance from the water surface of your tank to the bottom of the overflow weirs. So if we say this distance is two inches, and your tank dimensions are 48” x 24” wide, then we use simple math to figure out the amount of water that will be drained. To do this, multiply the depth (2”) x the width x the length of the tank and divide by 231. This comes out to 9.7 gallons. This tells us that we will need a sump size that can hold at least 9.7 gallons. It is highly recommended to at least double or triple this number. By doing this we increase the total volume of water in the system with a little safety factor. 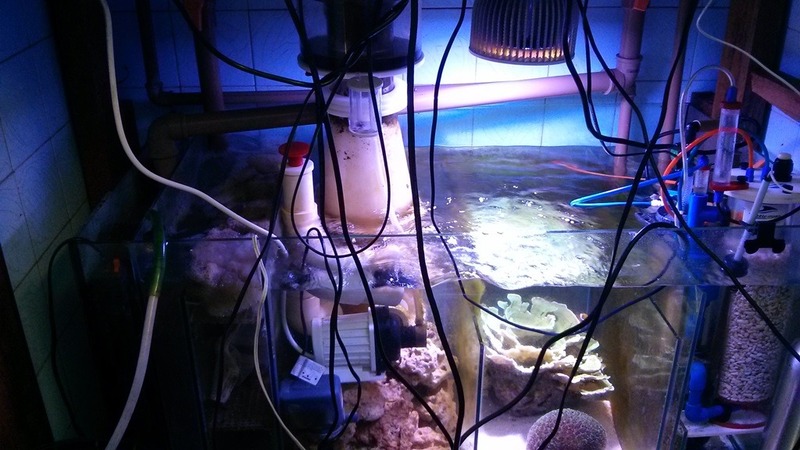 This is also beneficial for both fish and invertebrates because there is more water volume in the system. The bottom line is the larger the sump the better. It is also very important to make sure your return line is not too deep in the tank because this will act as a siphon should a power outage occur. The above layout shows a very workable and well designed sump that offers all of the above. This model offers dual tank drains which are very useful, especially if one incorporates a refugium into the sump area. By use of a ball valve on both drains, one can control the volume of water entering the sump from both locations. The ball valve controlling water going into the refugium area can be adjusted so Miracle Mud or other nitrate/phosphate reducing substrates will not be churned up by having too fast a flow. In this model the water flows into the sump from both ends and meets in the center chamber where the return pump will be located. Another very useful innovation is the provision of maintaining a constant water level for the protein skimmer. Most skimmers are sensitive to changes in water level which affect their efficiency. A constant water level chamber is a feature that should not be overlooked. This feature also serves as a bubble trap to reduce the amount of bubbles entering the return pump area. A probe holder is another nice feature which allows for installing probes for pH, temperature, etc. This is a useful feature that does not increase the cost of the sump much more than if you were to buy this accessory at a later time. To the right of the probe holder is an acrylic bracket for mounting a water top off sensor. When choosing a sump, do not base your selection on what you plan on doing now, but take into consideration what your future plans may be. The above sump is manufactured by Melev’s Reef and his company specializes in custom built sumps to suit your tank size and application. It is highly recommended to use either single or double union ball valves on the drain lines. This will allow you to shut the flow off and remove the sump for a good cleaning or any other reason you may have. The same also holds true for the return pump line and also allows you to adjust the flow going into your tank.